Rishikesh, at the foothills of the mighty Himalayas, has been revered as the world capital of yoga. The reason for this is that the sages who used to practice austerities in the Himalayas would come down periodically and establish their bases in the hostile months. Also, pilgrims who wished to go on their pilgrimage deeper into the Himalayas would make this their starting point. This confluence also lead to the development of several Ashrams and Rishikesh came into being as the Ashram town. Over the years Rishikesh has grown into a small but bustling town. Yet, the Ashram areas give the ambience of a small town village with tremendous spiritual energy. The mighty Ganges river flows by and the evenings are a delight to be on the banks with several aarti (lamp) ceremonies being held along the banks. With several narrow winding lanes and houses and shops coexisting, simply walking around and exploring the town is a charm in itself. There are several eateries. Food available is vegetarian in keeping with the spiritual leanings of the town and you will rarely find any alcohol. All of this makes for a unique cultural experience which delights most visitors to this place, including Westerners and people from all over the world. Being at the foothills of the Himalayas (altitude about 400 metres) and having the Ganges flow along it, the temperatures are relatively milder than most of North India. Yet, summers are warm and can be uncomfortable. Peak winter months (late December onwards and January) can be uncomfortably cold, especially for those who are otherwise accustomed to central heating. 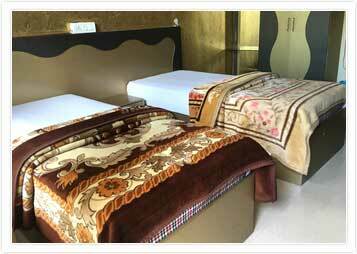 There are other activities that visitors find truly enjoyable about Rishikesh. These include river rafting on the Ganges or Camping by the riverside; short as well as longer mountain treks, as well as an experience at the World famous Ananda Spa in the mountains. This ambience has led to the sprinkling of exclusively Yoga ashrams and Study Centers and there is a natural ecosystem conducive to Yoga. The lifestyle automatically transitions into one that is comparatively sattvik (pure) and suitable for the absorption of Yoga. Ancient & Globally recognized Yoga schools such as the Maharshi Yoga Ashram, & the Sivananda, Divine Life Society found their origins from here. Today, there are several Yoga schools and traditions that peacefully co-exist in this wonderful town. 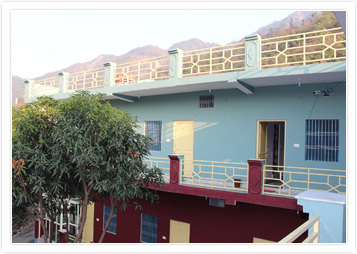 Even the most respected seat of Vedanta learning – the Dayananda Ashram is located here. Yoga mainly thrives around the Swargashram area of Rishikesh as well as across the 2 main bridges along the banks – the Ram Jhoola & Laxman Jhoola area. In all, it is worthwile to consider spending time learning Yoga at Rishikesh for the sincere yoga aspirant. Your Teacher training will be held in this Swargashram area amidst the various centres and Ashrams around. All care has been taken to provide the basic level of hygiene, comfort and space for you to get the most out of your training. 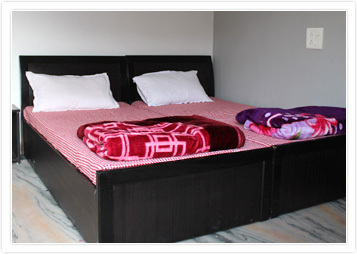 You will be accommodated in a pleasantly located Yogashala facility. 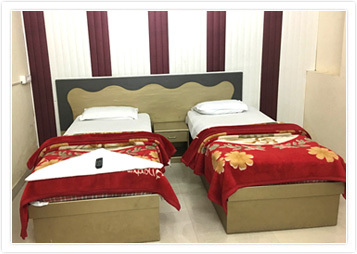 Room with Private attached bathroom - twin-share or single option are available with both hot and cold running water. The room will not be luxurious but definitely sufficient to assist your yoga practice. 3 nourishing vegetarian meals are provided daily during your course. There is wi-fi connectivity within your room at a very minimal cost as well as an internet centre in the lobby. There is also an ayurveda and holistic healing centre within the premises for those who may like to experience ayurveda maasages and treatments. Glance the pictures of the accommodation to see first hand about what to expect. In addition, once your register for the course, you are provided a detailed travel advisory to help you be fully prepared to the extent possible and make your entire experience smooth and hassle free.